﻿ Make your brand STAND FOR SOMETHING. Simply building awareness by “getting your name out there” doesn't cut it in today’s competitive, value-driven and more sophisticated pet owner marketplace. One of the greatest marketing mistakes your veterinary practice can make is to rely on mass messages -- trying to reach everyone -- instead of targeting your services and messages to a particular group or market segment. The bottom line: When you can identify your audience, you can develop targeted services and messaging that will RESONATE! How do you decide WHICH clients and pet owners to target? Read about Spotting Opportunities here. For a feline-only practice, we learned the most when we interviewed NEW clients to the practice. They told us why they left their former vet. We built our entire marketing strategy around these insights. Your veterinary software should allow you to create a DATABASE for sorting and cross-tabulating your clients based on customized variables. Use this database to identify the types of clients your practice is seeing now and which ones are already drawn to your practice. You can also identify types of clients your practice is NOT seeing. Use your software to go beyond simply tracking procedures and services sold. Instead, track type of pet and the diagnosis. 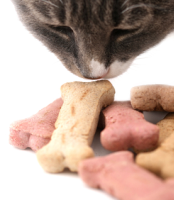 For example, one of the practices we work with treats numerous felines for chronic conditions and is targeting cats with diabetes, heart disease, kidney disease and pancreatitis. This information allows the practice to develop an expertise and put in place efforts to attract more of these targets. It’s much easier to identify marketing goals when you segment. Now, instead of saying, “We want more clients,” your practice will be equipped to define focused goals directed at specific targets. Instead of “more clients,” your practice might say: “We want to be seen as the go-to practice for treating arthritis in active dogs.” Now this is something worth targeting! Added bonus: Targeting segments makes it MUCH easier to measure marketing results! NEVER move forward with marketing efforts unless you can measure it! See list of related presentation topics below. We are happy to make a presentation to your practice or provide you with a pdf. Contact .